The first Nationwide Representative Congress of Ethnic Minorities in Vietnam concluded on May 13 in Hanoi with declarations of solidarity, patriotism and faithfulness to the Vietnamese Communist Party. Ethnic people pledged to carry out economic development policies, eliminate hunger, reduce poverty, encourage ethnic children to go to school, build health facilities, and improve healthcare quality. Speaking at the closing session, deputy Prime Minister and the congress’ steering committee head Nguyen Sinh Hung said the meeting was the next step in the development of Vietnam’s traditional ethnic societies. 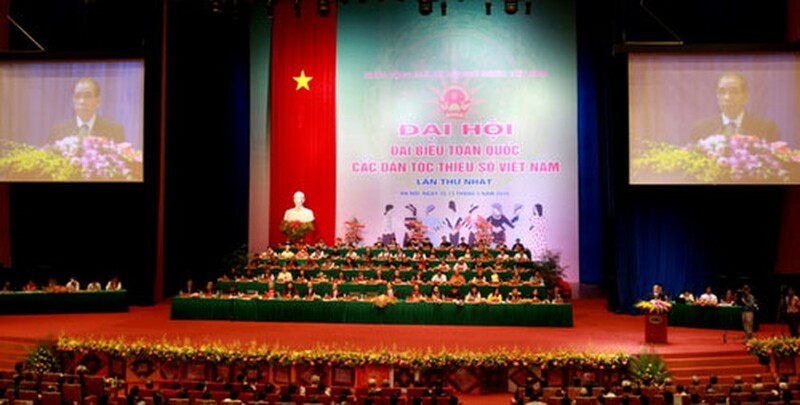 He hoped that all local and overseas Vietnamese people would disseminate the congress’ content to strengthen the country’s patriotic tradition and build greater solidarity among ethnic groups. The congress also honored and awarded outstanding individuals and groups. The meeting began on May 12 with the participation of 1,702 delegates representing the more than 12 million ethnic minority people. Party General Secretary Nong Duc Manh, Prime Minister Nguyen Tan Dung, the chairman of the Vietnam Fatherland Front Huynh Dam, vice President Nguyen Thi Doan, and vice National Assembly chairwoman Tong Thi Phong all attended the event.